During the revitalization of Lexington Kentucky’s downtown area, the historic Fayette County Courthouse required major renovations to accommodate the additional planned retail and restaurant space. The project involved increasing loads on existing footings, as well as dropping the basement elevation and undermining the existing historic foundation. The difficulties with the structure’s expansion included access to the basement, questions about the foundation’s existing load carrying capacity, and the ability to safely access and underpin the building. Geostabilization International helped develop an overall solution for underpinning portions of the 4-story structure and enabling access to the basement level for the proposed expansion. 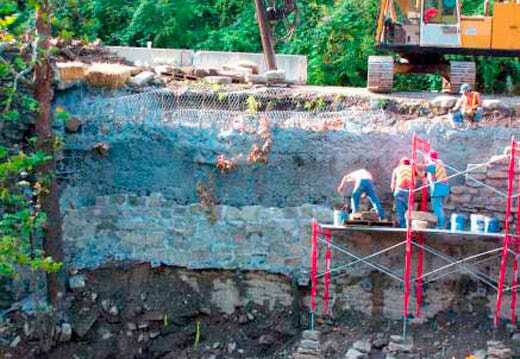 Working in conjunction with the structural engineer and general contractor, GeoStabilization formulated a plan to use micropile shoring for access to the basement, then to underpin relevant portions of the existing structure with a combination of micropiles and conventional underpinning pits. The “A-Frame” shoring system designed by GSI allowed access to the current basement level for the renovations and expansion as well as overcoming challenges presented by the overhead electrical hazards.